Are motorcycle riders allowed to share lanes with cars? Should I get a Dash Camera in my car? Dash camera footage can be very helpful to you if you are involved in a car accident and were not at fault. The footage would be able to help you prove that you were not at fault and would also help prove that the car accident caused your injuries. Sometimes photographs of the damage to the cars involved do not show the full impact of the crash and video of the crash will. If a photograph is worth 1,000 words then video is worth much more. Furthermore, in more serious crashes, people are not always able to take photographs of the scene of the collision or the cars involved. 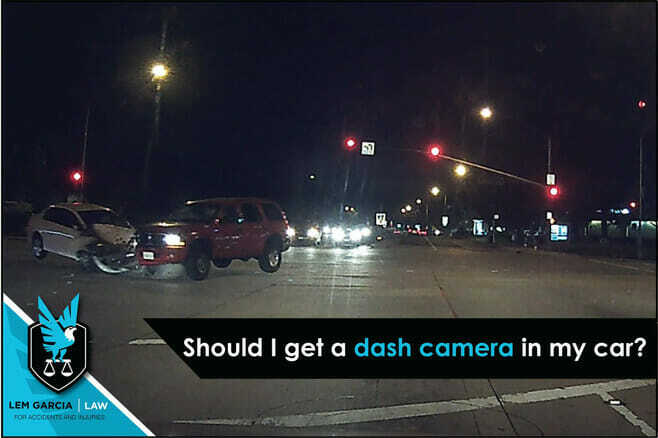 If you have a dash camera, you will always have video of what happened, whether you are seriously injured or not. However, it can also be very harmful to your case if you are at fault. If you are involved in a car accident, and are subsequently involved in a lawsuit for your car accident, your dash camera footage is discoverable, which means that if you are at fault, you may have to provide the dash camera footage to the other party. In our practice here, dash camera footage has proven to be very helpful. Several witnesses with dash cameras have provided us with their footage to help us prove that our client was not at fault. Numerous clients have provided us with their dash camera footage to help us show to the other party why they were at fault and how forceful the impact was. It is especially helpful in cases where liability is in dispute because it is unclear who ran the red light or who changed lanes into whom. When we have dash camera footage, it is very persuasive to the insurance adjuster handling your case. We have noticed a marked increase in settlement offers when dash camera footage is available. If you were injured in a car accident, we may be able to help you – whether or not you have dash camera footage. Call Lem Garcia Law, car accident attorney in West Covina for help today.